MSI Wind netbooks are manufactured by Micro-Star International, a Taiwan based maker of computers and computer components. They are currently on their 3rd generation offering with the U123 which is an upgraded version of the U120 which was an updated version of the U100 MSI’s first entry in the netbook space. The U120 and U123 are equipped with an advance facial recognition security software that lets the user login as they prepare to use the netbook. Both U100 and U120 are still available for purchase. The MSI Wind U123 comes in 6 models varied by the color blue or red, battery setup between 6- or 9-cell batteries, and whether or not equipped with bluetooth. The basic specs include facial recognition security, 10.2″ screen with 1024 x 600 display, 1.66 GHz Intel Atom 280, Intel 945GSE+ ICH7-M chipset, 1GB RAM expandable to 2GB, Intel GMA950 graphics, 1.3 MP Webcam, 160 GB HDD, HD Audio, and Windows XP. Dimension: 10.2″ x 7.1″ x 1.2″ ; 2.6 lbs. 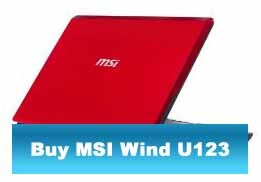 Approximate price range for the MSI Wind U123 is $320 – $380. MSI Wind U120 has two primary models centered around the colors gray and white. Avaialble since January 2009, it’s approximate price is $320. Facial recognition security, 10″ WSVGA LCD with 1024 x 600 display, 1.6 GHz Atom Intel N270 CPU, Intel 945GSE+ ICH7-M chipset, Intel GMA950 graphics, 1GB RAM expandable to 2GB, 1.3 MP Webcam, 160 GB HDD, HD Audio, and Windows XP. Approximate size: 10.23″ x 7.08″ x 1.24″ ; 2.3 lbs. MSI Wind U120 are available for $320. 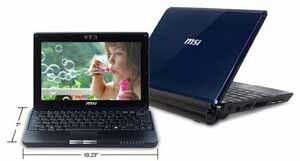 The MSI Wind U100 is a popular and well received first entry by MSI in the netbook market. It’s basic spec includes 10″ WSVGA LCD with 1024 x 600 display, 1.6 GHz Atom Intel N270 CPU, Intel 945GSE+ ICH7-M chipset, Intel GMA950 graphics, 1GB RAM expandable to 2GB, 1.3 MP Webcam, 160 GB HDD, HD Audio, and Windows XP. Dimension: 10.23″ x 7.08″ x 1.2″ ; 2.6 lbs. 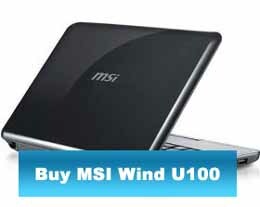 MSI Wind U100 are still available for approximately $288-$325.